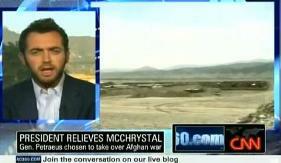 With Gen. Stanley McChrystal relieved of his Afghanistan duties in the wake of the Rolling Stone profile, the occasional TV talking head has put the blame on Michael Hastings for reporting too much. “I’d love to ask about what he plans to do in the war in Afghanistan,” said Hastings – not answering the rhetorical question over whether there would be an upcoming all-access Rolling Stone article about Gen. Petraeus’ Afghanistan turn. Most TV journalists have avoided placing any blame on Hastings, but there have been many who expressed shock at how Hastings was able to gain so much access (The Daily Show touched on this last night). This ignores Hastings’ lengthy record as a war correspondent. Others, like Politico, (initially) implied a more mainstream media member would not have put forth the same article, for fear of retribution in the form of declining access. The truth is, the article was so ultimately successful precisely because it was fair and accurate – no one, including Gen. McChrystal, disputed the facts.